You are here: Home / Recipes / Preserved Lemons. Tasty and fermented. 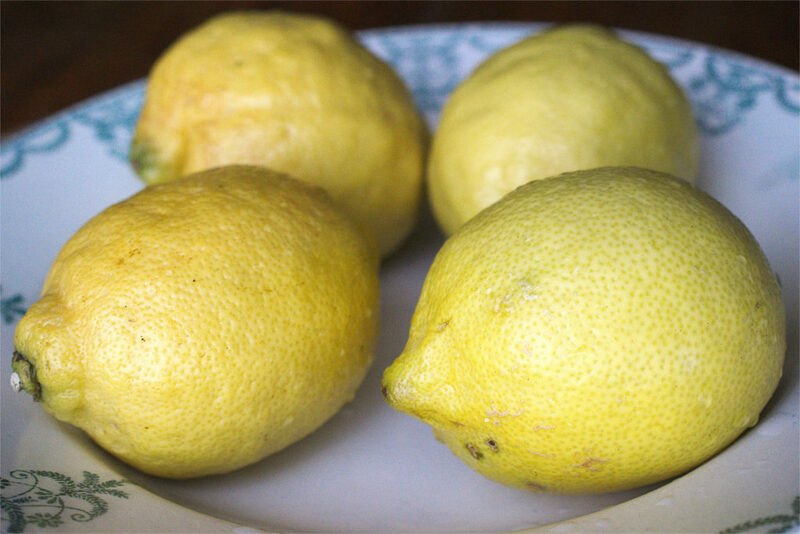 Preserved lemons are a popular ingredient in North-African cooking. Their use isn’t limited to just tagines though. You can use them in dressings, sauces, pastas, salads or any other dish that needs a bit of citrus. They’re also surprisingly easy to make. Eating a fresh lemon whole, is not something most people would do. This is however exactly what you do with preserved lemons. You can use them in their entirety: skin, rind and flesh. It’s the fermentation process that makes this possible. 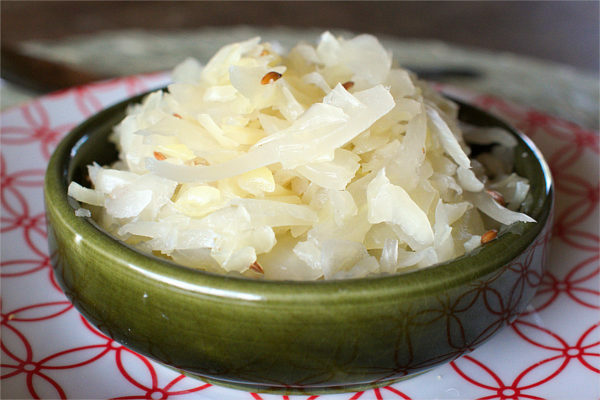 In the past, fermentation was used as a way of making fresh food last longer. Of course we now have refrigeration for this. So why is this way of preserving lemons still used? The simple answer is: taste. Fermentation mellows the sour taste of the lemons and it makes the bitterness of the rind and pith less intense. At the same time, the brine gives them a salty flavor. 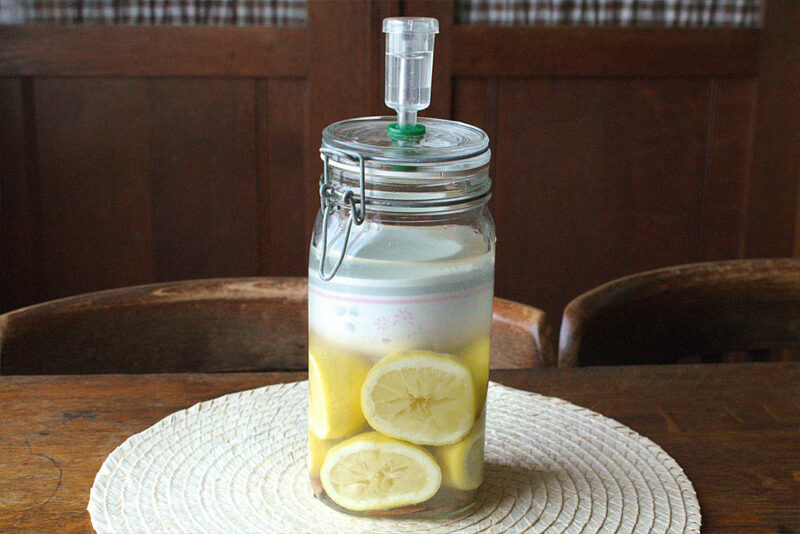 Fermented lemons are simply different than fresh lemons. 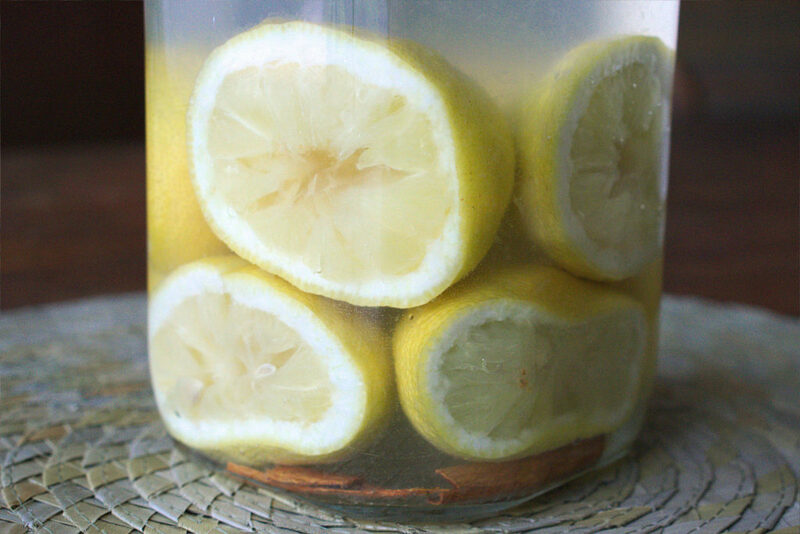 Making your own preserved lemons isn’t difficult and doesn’t require any fancy equipment. All you really need is a glass jar. Despite this, we use a closed fermentation jar with an airlock. It’s just a bit more convenient, especially if you plan to ferment stuff regularly. You can buy a jar like that on-line or you can make your own. You can find a great tutorial for this here. 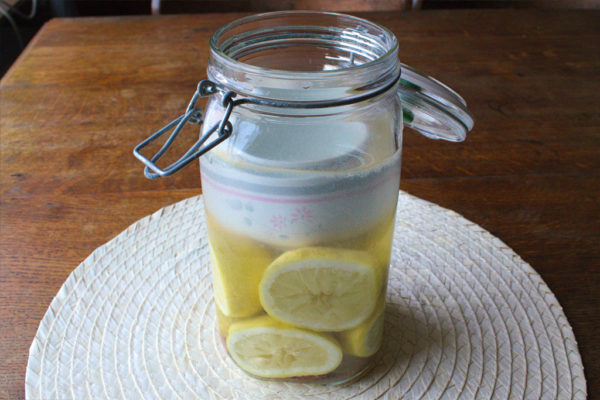 Many recipes advise you to keep your preserved lemons in the fridge. Personally, I wouldn’t recommend this. Fermentation works best at room temperature, as this is the temperature the fermentation bacteria prefer. Storing them in the fridge will stop all bacteria from growing. This will potentially stop them from spoiling, but will also stop any further development of the lemons’ taste. 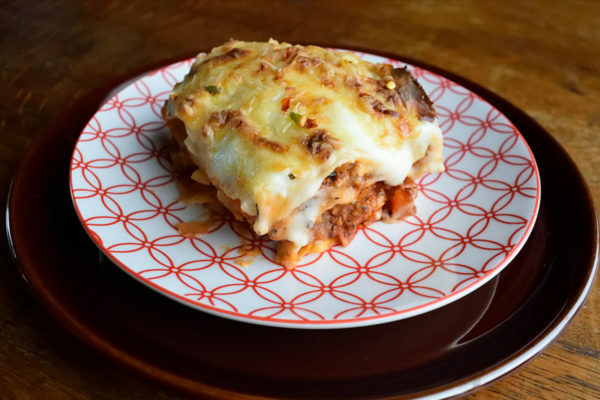 If you’re still not sure about storing them unrefrigerated, at least keep them at room temperature for the first 4 weeks, giving the fermentation process a chance. Whatever you do though, make sure you use clean utensils when you take any lemons from the jar. That way you avoid contaminating the inside of the jar with unwanted bacteria. Wash the jar you want to use in hot soapy water. Rinse it thoroughly and leave to dry. Scrub the lemons clean with some cold water. Because you'll be eating the whole fruit, including the peel, it's best to use organic lemons. Eating pesticides is something we want to try to avoid. Weigh the lemons and make a note of it. You'll need this information later, to calculate the amount of salt needed for fermentation. Cut the lemons in half. 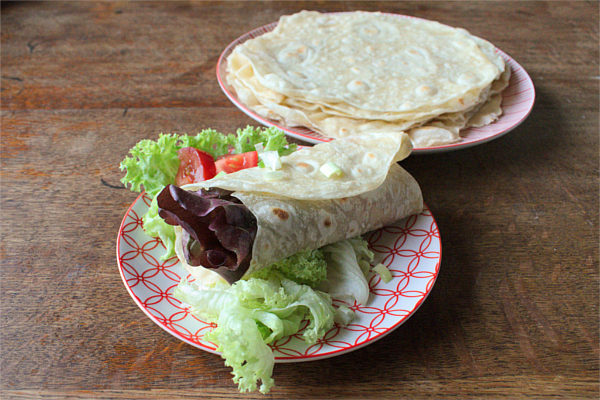 Then place them on a deep plate and push down on them with your hand to flatten them. You can also do this while packing them into the jar. However, I find that I have more leverage doing it this way. Start filling the jar. First add the stick of cinnamon. Then layer the lemons on top. Squeeze them in as tightly as you can and push them down firmly. By putting the cinnamon on the bottom, you'll prevent it from floating. This is important because anything not submerged can spoil and will then ruin the entire batch. Now calculate the amount of salt needed for fermentation. First calculate the total weight of the lemons and the water needed to submerge them. You made a note of the weight of the lemons earlier. But you'll have to guess the amount of water you'll need. 1/3 of the total contents of the jar, is probably a good place to start. Add the salt to the water and stir until dissolved. Also add any lemon juice that was squeezed out of the lemons earlier. Pour the brine into the jar. Make sure the lemons are completely submerged. Put something heavy on top of the lemons, to stop them from floating to the top. You can use a small plastic bag filled with salt water, a small glass jar or (as I did) a teacup. Whatever you use though, make sure it's clean. This way you'll prevent contamination. 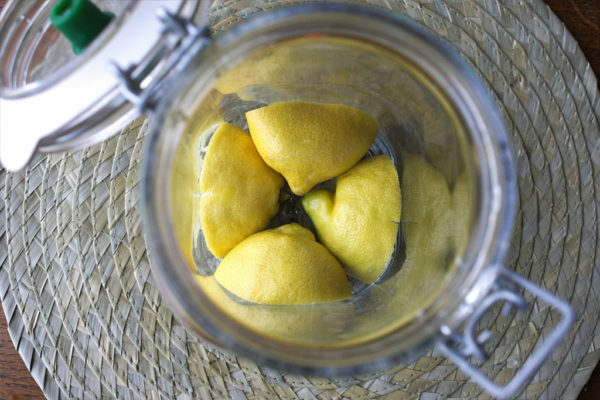 Leave the lemons to ferment for about 4 weeks. It's best to store the jar at room temperature, as this is the temperature the fermentation bacteria prefer. We store ours in the pantry. Fermented lemons will keep for several months. 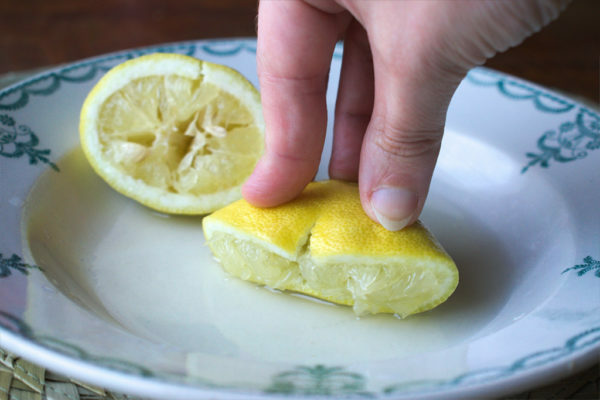 Just make sure you use clean utensils when you take lemons from the jar. 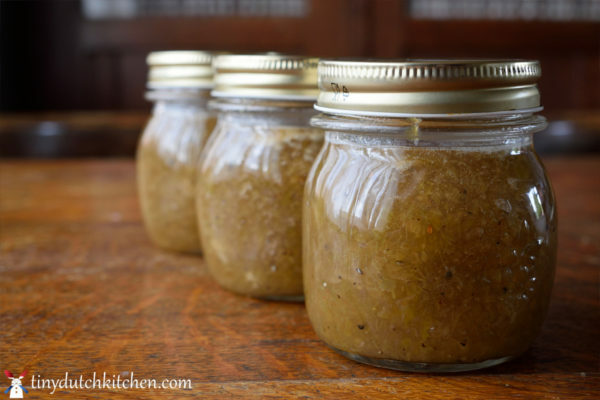 This way you'll avoid contaminating the inside of the jar with unwanted bacteria.